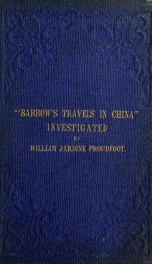 Read online ""Barrow's Travels in China." An investigation into the origin and authenticity of the "facts and observations" related in a work entitled "Travels in China, by John Barrow, F.R.S." (afterwards Sir J. Barrow Bart.) Proceded by a preliminary inquiry into th" by Proudfoot, William Jardine. Instant free e-book download at OnRead.com.